In fact, after war had broken out and following the break up of her marriage and eventual divorce during this period, she was trapped in Southern Rhodesia until she crossed the border into South Africa. From there she found passage back to Britain, whilst the war was still on in 1944, leaving her young son Robin behind at boarding school and under the care of his unstable father. More than a year later Robin would return from Africa and go to live with her parents. She was already working and writing in London by this time. Spark’s own motives for travelling to Southern Rhodesia are somewhat counter to the dominant discourse of emigration, especially by white women in the colonial period before the Second World War. White women were in high demand in the colonies, and in Southern Rhodesia where the white male population outnumbered the white women by a ratio of three to one, their role as a ‘rationed commodity’ quickly became apparent to Spark. Indeed, even before her ship docked in Cape Town, the family of a young South African man she had met on the two-week boat journey attempted to persuade her to stop her journey there and to marry their son instead of her fiancé. Once she joins the white community in Southern Rhodesia, her self-styled role of Scottish female adventurer comes up sharply against the prescriptions of a powerful colonial discourse that interpolates and manipulates the bodies and lives of white colonial women as ambivalent tools of the racialised structures of the colonial regime. Spark’s distaste for the ex-pat whites she meets, and the Afrikaner whites, suggests more than her own personal dislike and a certain snobbery about their cultures or lack of it, but more a horror and revulsion of what she too may be expected to become. Her autobiography reveals a sharp division between the concerns and duties of the ‘married woman’ she has agreed to be, but has no natural temperament for, and her desire to observe and write about human life. Spark drew on her experiences in Southern Rhodesia in her stories ‘The Seraph and the Zambezi’, ‘The Portobello Road’, ‘Bang-Bang You’re Dead’, ‘The Pawnbroker’s Wife’, and ‘The Go-Away Bird’, as well as her radio play, The Dry River Bed. These stories, written in London in the 1950s and 60s, retrieve these earlier formative experiences in a cooler light and reflect on the twin legacies of predatory white colonial men, and the fate of the colonised. In many of Spark’s short stories set in Africa, emotions run high and murders are multiple. The violence done against the white women in the stories brings questions of the destructive libidinal energies of colonial culture into the foreground. 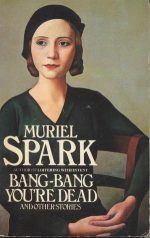 In ‘Bang-Bang You’re Dead’, this reflection on the colonial past is most apparent with the central character Sybil, a writer, perhaps the closest figure in any of the stories to Spark herself. She shows film reels of her time in Africa to her companions in Britain, and reflects on the ways on which these films both reveal and hide the true experience of her time there. Asked if she had any trouble with the black population, she replies, ‘No, only with the whites’. The narrative played out on the screen cannot reveal the violence that followed the screened scenes. Sybil watches the film reels with apparent dispassion and relates how she no longer keeps in touch with any of the people featured in the films as they were all killed in shooting affairs. But Sybil’s own private reflection on the time reveals that the films were made on the day Sybil’s rejected lover shot her friend – whom he had mistaken for her – and then turned the gun on himself. ‘Was it a typical afternoon on the Colony?’, she is asked. ‘It was and it wasn’t’, she replies. (CS, p.85) The hidden horror of the films reels is that her friend was shot in her place and that the ‘joke’ of the prevalence of shooting affairs in Africa is an index to a far more serious regime of sexual predation and violence at the heart of the colonial project. As I note in an earlier essay on Spark’s African stories, the framework of desire and disavowal that insists on the desirability of white women, as prized vectors of power in colonial spaces, masks their absorption into a structure of brutalised heightened sexual interactions, and a torment to produce the heterosexual logic of the colony.2 Sybil reveals the compulsory performance of desire as normalised daily interaction: she ‘worked herself as in a frenzy of self-discipline, into a state of carnal excitement over the men’, at parties where the men outnumber the women considerably, and they appear to have multiple affairs as a norm in order to cater to the demands of the men for sexual interaction. This tacit sharing of the women, including the married ones, meets the numerical imbalance between the sexes but puts the women at great risk. Her numerous affairs she considers a form of heroism, a sacrifice of bodily autonomy that meets the overwhelming sexual needs of the men, as if servicing them. The perversity of this situation is brought to the fore as she succumbs to a form of ‘tropical flu’ which produces a twilight of the senses; the body so desensitised by sexual servitude rejects this monstrous double standard of the hyperbolic sexual logic of the colony, which enforces sharing of women whilst punishing those who are persuaded or forced to service this system. Following the logic of the colony, she reflects ‘I’m a rather frigid freak I suppose’. Yet as Sybil reflects on the scenes, she is torn between seeing the system as monstrous, or herself: ‘Am I a woman or an intellectual monster?’ As with Spark’s own writing life, the ‘intellectual monster’ will prevail — she will stop seeing herself as monstrous or unnatural and find a voice to capture the pervasive sexual violence of the culture that tried to define her. Sybil leaves the murderous sexual chaos of the colony to the relative peace of Britain. Spark, too, took her life in her hands returning from South Africa aboard a troop ship that could have easily been targeted and sunk on the way home. Her return to Edinburgh lasted a few days, armed with references for secretarial work she quickly found a job in London working for Sefton Delmer at the BBC as part of the war effort. She would start writing about her Southern African experiences in the early 1950s with her first story, ‘The Seraph and the Zambezi’. Martin Stannard, Muriel Spark: The Biography, Weidenfield and Nicholson, 2009, p. 45. Eleanor Byrne, ‘Muriel Spark Shot in Africa’, in Theorising Muriel Spark, ed. M. McQuillan, Palgrave, 2002. Eleanor Byrne is Senior Lecturer in the Department of English at Manchester Metropolitan University.